Based in Camarillo, about 13 miles inland from the beaches of Oxnard in Southern California, Jennings Guitars was officially established in December 2014 by owner/founder Chad Jennings and co-founder Devin Murdoch. Chad’s career in luthiery began at the age of 14 when he built a guitar for an eighth-grade science-fair project, while Devin spent his high-school years building skateboards by laminating various strips of timber and shaping the resulting planks into decks. Jennings instruments are available in the UK via James’ Home Of Tone in Stourbridge in the West Midlands. We’ve been consistently impressed by the selection of boutique brands that Home Of Tone’s eponymous head honcho James Gascoigne has carefully curated over the last few years, and in a climate where simply having a good Instagram game makes it possible for anyone to look the part, a trusted set of eyes and ears is invaluable. Jennings Guitars does, of course, have a good Instagram game, but Chad and Devin clearly know a thing or three about building a good electric guitar as well, as our pair of review instruments proves. 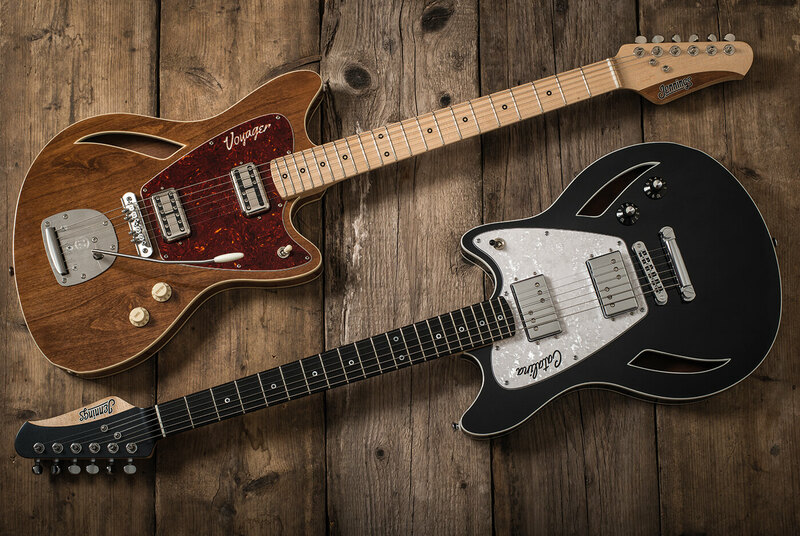 Joined in the Jennings range by the T-style Navigator and solidbody Voyager, the Voyager Deluxe and Catalina are offset thinline designs available in a variety of configurations. Both semi-hollow designs with alder bodies and centre-blocks, the Voyager Deluxe is the more offset of the pair, with an outline reminiscent of a Jazzmaster with more of a Mustang-like shape to its horns. 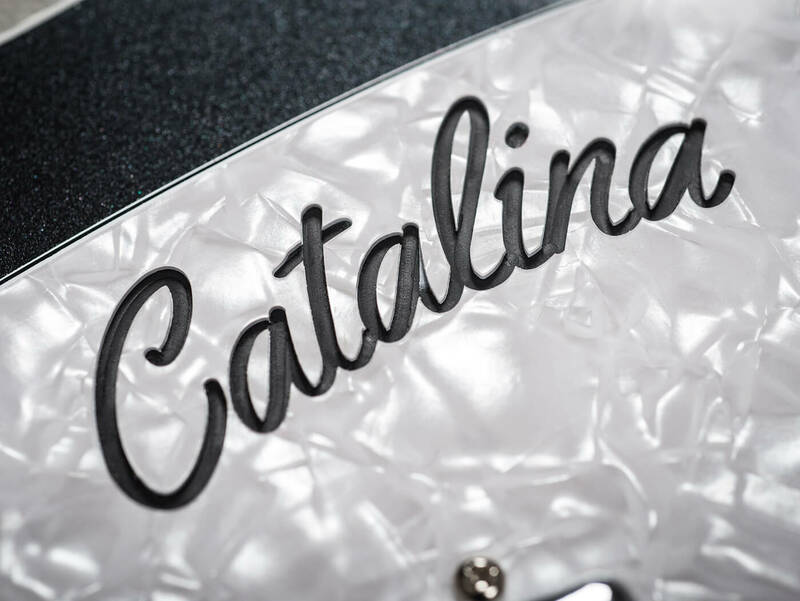 The Catalina has a more rounded and symmetrical lower bout inspired by larger semi-acoustic instruments, and sports two slash-shaped, bound f-holes to the Voyager Deluxe’s one. The Catalina’s black nitrocellulose finish is actually a subtle metallic, while the Voyager Deluxe features what the spec sheet describes as a ‘mid/light’ mahogany stain. In combination with the matching accent on the stepped headstock and the red tortoiseshell Decoboom pickguard, it lends the Voyager Deluxe more of an organic vibe and visually, it’s our favourite of the two. We’ve seen stepped headstock designs before, of course – Fano, Suhr and Shelton are a few brands that spring to mind – but it’s particularly well executed here, with the company’s retro logo transferred onto a slice of stained alder on the Voyager Deluxe and exposed maple on the Catalina’s otherwise black-finished peghead. On both instruments, the nitro has been sprayed and buffed expertly to a high-gloss sheen. We’ve become so used to playing and reviewing factory-aged guitars these days that opening a case and pulling out a boutique electric that hasn’t had a set of car keys thrown at it feels like a novelty. That said, the Voyager Deluxe’s earthier vibe is only going to look cooler when its eventual owner wears their own story into it. For those who want to accelerate that process, satin and exposed grain finishes are also available to order. When it comes to electronics, both Jennings models feature simple wiring with high-quality components including pickups from the respected Canadian winder Tim McNelly, Emerson CTS pots and paper-in-oil tone caps and Switchcraft toggle switches and jack sockets. On the hardware front, Chad and Devin have opted for Kluson’s Contemporary Diecast tuners, which have an understated appearance but provide a smooth and secure tuning experience thanks to their 19:1 ratio. 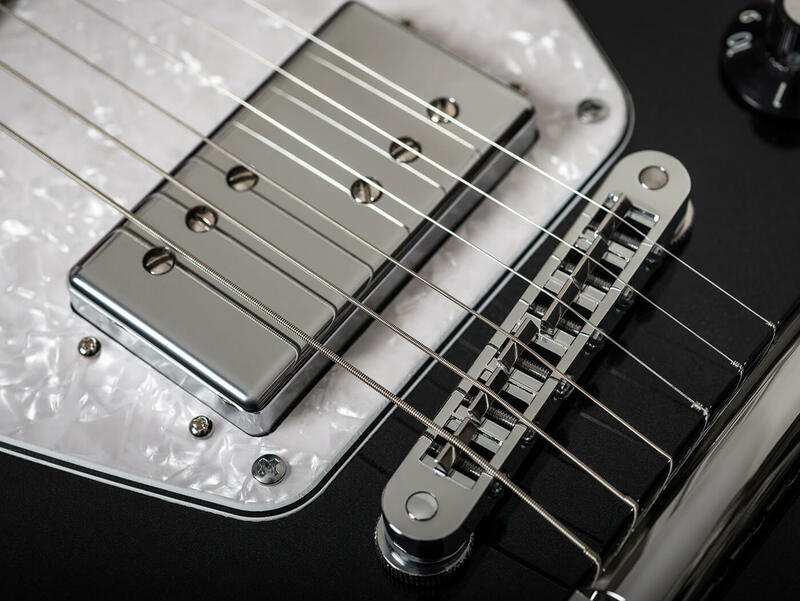 The Catalina sports a Tune-o-matic and stoptail combo, while the Voyager is equipped with the increasingly ubiquitous Mastery Offset Bridge and Vibrato – a popular choice among offset fans. Thanks in part to quartersawn, medium-depth bolt-on maple necks with maple and ebony slab fingerboards, both guitars have a lively snap and no shortage of dynamic response. The Catalina’s ebony fretboard doesn’t have the flawless appearance of the Voyager Deluxe’s gloss-finished maple, but even with 12-inch fingerboard radii, the relatively thin fretwire on both guitars throws some satisfying vintage-style fight into the equation when bending strings. 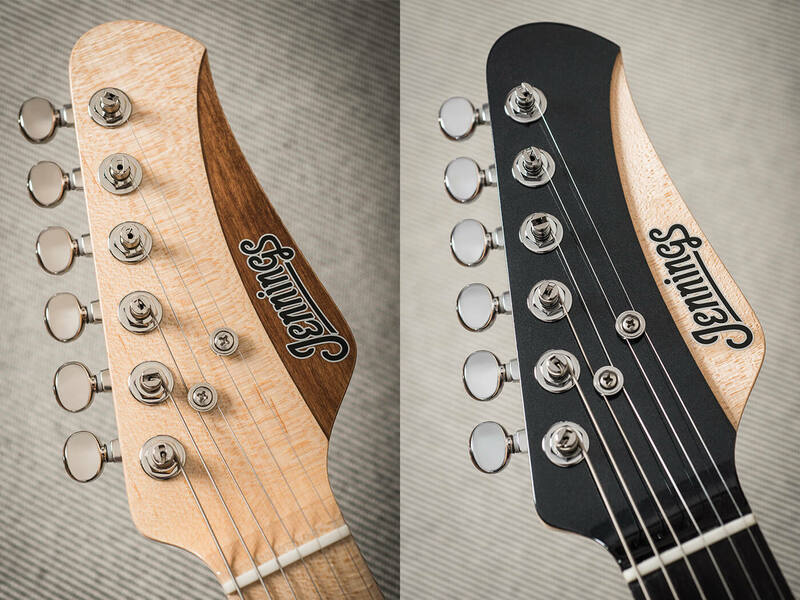 The fretwire certainly helps with clarity, too, but the Jennings’ loud, airy and clear acoustic voices aren’t thin or lacking in woodiness. 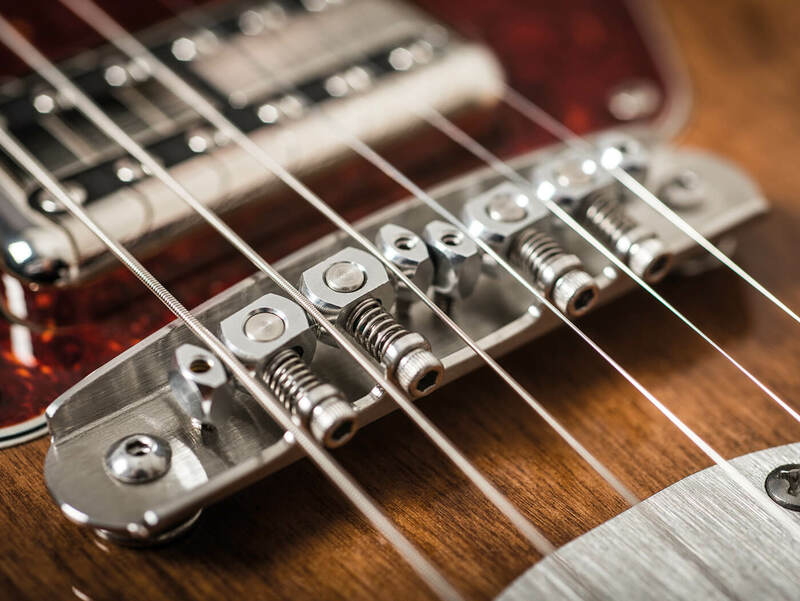 McNelly pickups have impressed us in the past and both sets here have found a happy home in their respective instruments. 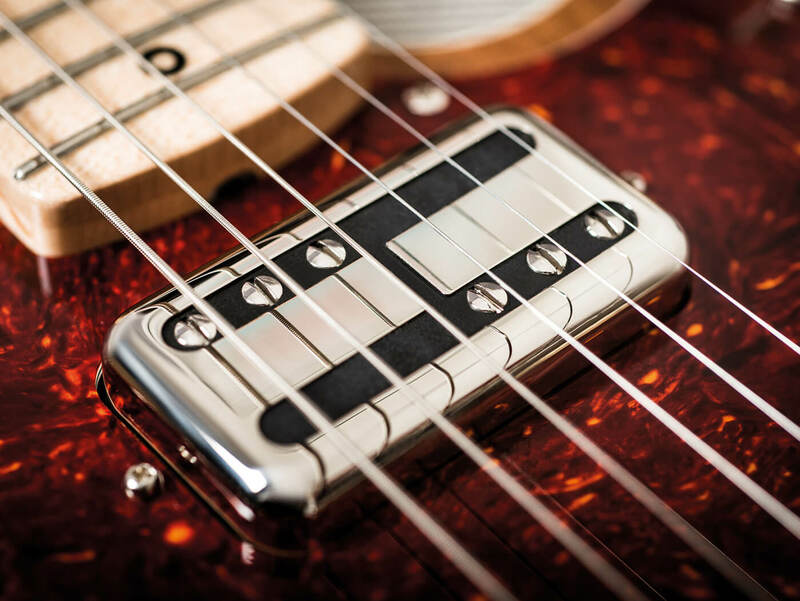 The Voyager Deluxe has a SparkleTron and a Stagger Swagger (a P-90-inspired pickup with hum-cancelling coils) in humbucker-sized Filter’Tron covers, while the Catalina has a pair of McNelly’s ‘Wild Range’ reinventions of Seth Lover’s early 1970s design. As you might expect, the Catalina’s tone is a little bit Thinline Telecaster and a little bit Starcaster, but there’s less fog here than we remember from the Wide Range neck pickup on our long-gone and much-missed 1973 Telecaster Custom. The result is excellent definition and jangle for arpeggios and it also helps keep mush at bay when used with a long chain of stompbox effects. Wind up the gain and the Catalina has a really compelling and expressive voice for soloing that suits Mark Knopfler-esque fingerstyle lead work as well as it does indie and Americana chords. 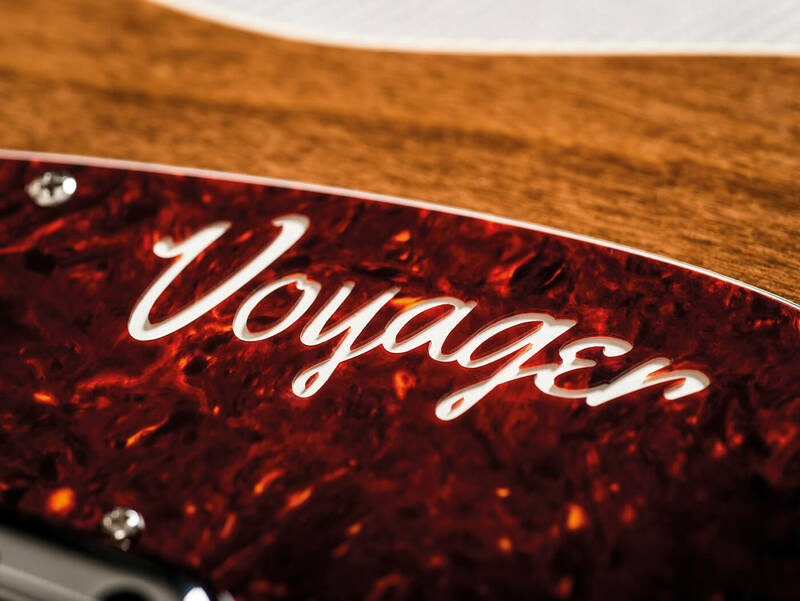 It’s Voyager by name, Voyager by nature as the vibrato-equipped Jennings offers a more thrilling ride than the Catalina. Where the Catalina’s controls offer a range of variations on a theme, the Stagger Swagger and SparkleTron’s voices are more distinct. Clarity is again the overriding theme in the neck position, but down at the bridge, there’s real drama. The SparkleTron is one of our absolute favourite Filter’Tron-inspired pickups and here, we fall in love with it all over again. Somehow clear and harmonically complex at the same time, it’s a glorious sound that growls, chimes and inspires in equal measure. It’s impossible to resist cranking up the spring reverb and reaching for that Mastery Vibrato arm… then, all of a sudden, white horses are crashing all around you and you are in serious danger of being swept away. Surf odyssey, anyone?